1) SWIM one or more letters in any body of open water, using a GPS device to record the results. You can swim your initial(s) or your whole name. 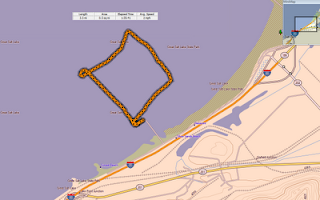 2) Use a GPS device to capture your swim. (I have had good results with a Garmin Forerunner 305 tucked under my cap). 3) Send an aerial image with the GPS overlay (like the picture above) to joshuakgreen@gmail.com. 4) You can use landmarks and natural features as reference points, but you may NOT have another person guide you. 5) Submit your entry by September 30. I will post any contest entries I get on the blog as well as the Facebook page. I will figure out a way to have everyone vote for a winner. It wouldn't be a contest without a prize, right? Since several of you have been teasing me about my wild swimsuits, the winner will get a gift certificate to Splish.com so you can get your own crazy suit!